Search Results for "rocket launch"
UNITED STATES 1960s: Rocket engines fire / Smoke by engines / Low angle view, rocket takes off / Rocket launching / Long shot, rocket launching / Crowd looking up / Crowd looking up / Rocket launching. UNITED STATES 1960s: Silhouette of rocket on launchpad / Rocket launches / Rocket launches / Rocket launching / Dissolve, sign for Goddard Space Flight Center, pan to building. United States: 1950s: Passengers enjoy a meal on a train. People watching view from train window. Powerboat racing. Formation flight display team. Rocket launching. Satellite observing rocket launch. Cameras filming rocket launch. UNITED STATES 1960s: View of rocket launching / Rocket launching / Rocket on truck / Children in audience / Children look through glass / Tilt down launch site, rocket on truck. UNITED STATES: 1960s: Flames on ground as rocket launched. Rocket travels upwards. Writing on side of rocket. Clouds around base as rocket launches. UNITED STATES 1960s: Rocket on launchpad / Workers building rocket / Men attach nose cone / Man tightens bolt / Man tightens part / View of control panel, zoom out to men at controls / Rocket / Light blinking / Rocket launches / Rocket launches. UNITED STATES: 1960s: SLV5 rocket launch in slow motion. Rocket takes off. Clouds on ground as rocket launched. 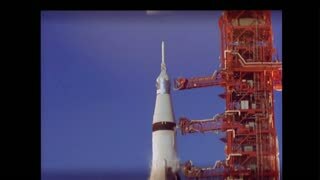 UNITED STATES 1960s: Slow motion, rocket launching / Dissolve, close up of engines firing / Rocket launching / Close up, rocket separating from pad / Equipment lifting. 1960s: Text appears over rocket on launchpad. Rocket launches in distance. Animated satellite spins and separates. Text over rocket launch. Satellite drifts through space. 1960s: View of rocket launch site. Pan up rocket at launch site. View of rocket. 1970s: Rocket takes off. 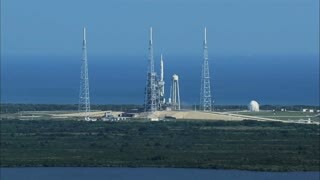 Rocket breaks from launch base. Rocket takes off, smoke billows. Rocket launches. 1960s: Rocket launch site. Factory building. Large red rocket launch site in isolated area. United States, 1940s: rocket launched from ground. Ball of flames falls to ground. Black smoke on ground after crash. 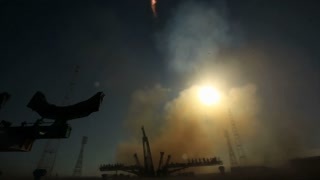 Rocket launches in black smoke. 1960s: Crane lifts rocket onto launch platform. Rocket launches, smoke billows. Woman uses tape measure to measure dimensions of Zenith Golden Triangle clock. UNITED STATES 1960s: Rocket launching / Rocket lowers, explodes / View of explosion on launch site / High angle view, men organize wreckage / Man looks through wreckage. 1960s: Lunar landscape. Rocket ready to launch and rockets launch. Engineers in lab ready satellite. 1960s: Crew in work wear outside. Control room operator on headset. Room of engineers. Small rocket ready to launch at angle. Two operators at control panel. Smoke and fire of rocket launch in dark. 1950s: Soldiers enter building. Men sit at console, launch rocket. Rocket launches into air. 1960s: Flames shoot out from under rocket, rocket launches. Rocket flies into sky. 1960s: Four fighter planes fly in unison through sky. Rocket emerges from underwater. Rocket launch. Rocket with billowing smoke. UNITED STATES 1960s: Long shot, rocket launching / Flames in sky / View from rocket, piece falling away / Long shot of rocket, flames / View from rocket, piece falling away. 1976 - Schoolchildren launch a rocket they made in celebration of the 50th anniversary of the first successful liquid rocket launch. 1960s: Animation of rocket launch. Words “action” and “reaction” appear. Rocket blasts off, flies up sky. Inside of rocket shows combustion engine, arrows show direction. Blueprint of rocket. 1960s: Man salutes. Rocket launch, underbelly of train. Pillar of flames and pluming smoke by water. Rocket flame. Rocket base structure. Fuse. Falling rocket part. 1960s: Saturn V rocket on moving launch platform. 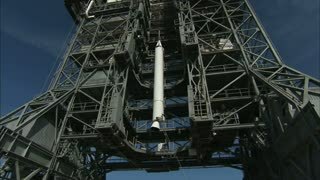 Helicopter ascends near the base of Saturn V launch platform, Saturn V rocket near launch scaffolding.